These stories deal with the uniquely intimate relationship between patients and their physicians. It is a relationship based on the patient's history, secrets and deepest fears, but also those of his or her doctor. In these touching essays, Dr. Grubb recounts stories that have stayed with him, influenced him as a physician and touched him as a person. He depicts memorable encounters he has had in his calling as he strives to be a good healer and a good human being. For years, I have considered Blair Grubb the finest example of a physician who never forgets that he is a human being first. This book reinforces. that belief. It is a book I will want to keep close at hand and re-read often. Grubb's writing is concise and poignant. He effectively conveys how those of us in the health care profession are affected and changed by the complex relationships we form with our patients as we care for them. Dr. Grubb has written a marvelous, insightful work about one of the oldest and most powerful forces in health care today - the complex, always evolving relationship between physicians and their patients. His moving, thoughtful accounts of his encounters with patients provide physicians, health-care professionals and others with an opportunity to reflect and to rededicate themselves to using empathetic communication skills when caring for their patients. by Jodie Elrod at the EP Lab Digest. "Dr. Blair Grubb to read at Poetry Speaks"
by Brigitta Burks at the Toledo Free Press. Blair Grubb is professor of cardiovascular medicine and pediatrics and Director of Electrophysiology Services at the University of Toledo Medical Center. He writes poetry and essays and is a pen and ink artist. His essays have been published in Toledo Medicine, Annals of Internal Medicine, Pen World and PACE. He is also the author of The Fainting Phenomenon: Understanding Why People Faint and What Can Be Done About It. 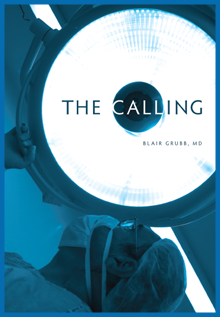 The Calling, a collection of personal stories on the unique relationships between patients and their physicians, was written by Blair Grubb, MD and recently published by the University of Toledo Press. In this interview we talk with Dr. Grubb, Director of Electrophysiology Services at the University of Toledo Medical Center, about his published work.